I was really nervous to press 'share' on Sewing Leftovers, so I can't thank the sewing community enough for the interest and support shown for it so far! Some people have even started sharing their own leftovers makes using the #sewingleftovers hashtag... so I thought I'd better get on with it and show you mine! 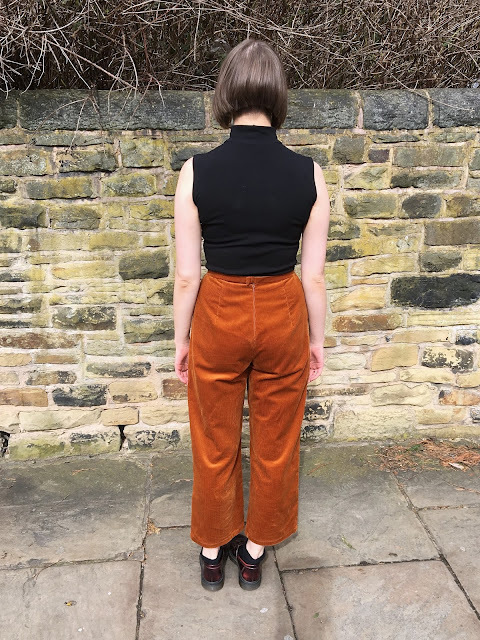 This first Leftovers make put real challenge to suggested fabric requirements and lay plans: here's 1m of orange corduroy VS the New Look 6459 trousers. Leftover fabric: Just over 1m. I bought more than needed as I originally thought I would make the longer version of this skirt. Leftovers-wise, what did I learn? What many of us know already: not to follow the suggested lay plan. 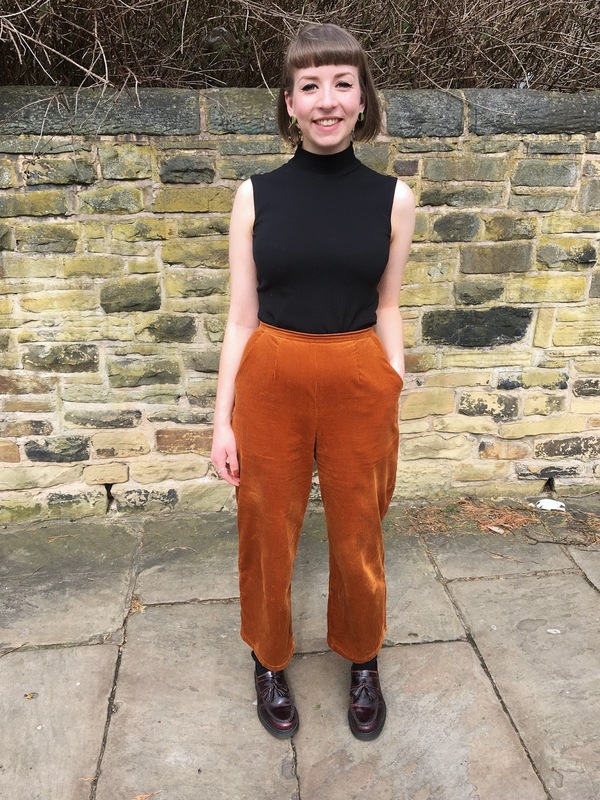 I positioned the trouser leg pieces next to one another and cut my waistband on the cross grain (this worked better with the direction of the corduroy) and I squeezed mine out of just over 1m rather than the suggested 1.8m. It was also fun to experiment with making this pattern in a not-so-expected fabric. I keep seeing this pattern pop up online (as made by some of the internet's most fashionable sewists, @adaspragg and @michelleofatime) so I was pretty pleased to find it free with February's Sew Magazine. 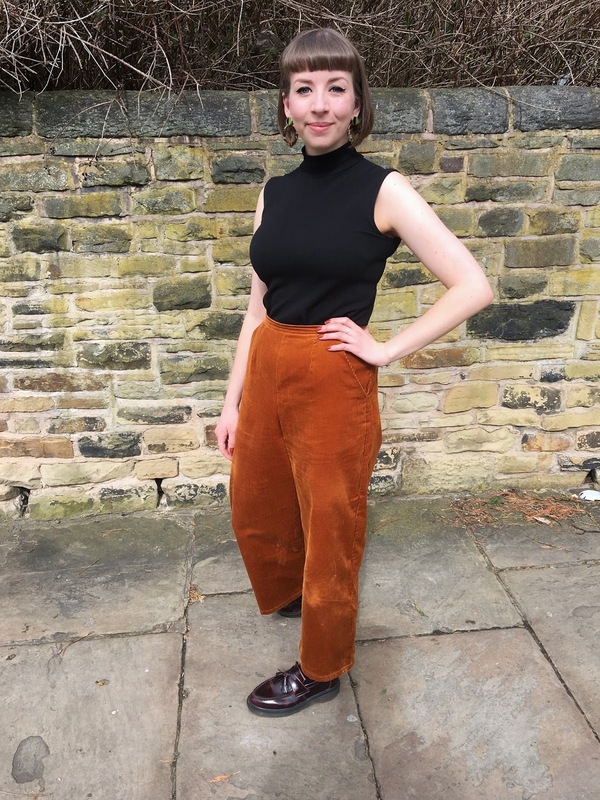 Whilst the pattern is pretty unassuming from it's cover and the top isn't so exciting, the trousers are a simple, high waisted, wide-legged staple, with a zip fastening in the back. They were really easy to make and work well in such a bold fabric. 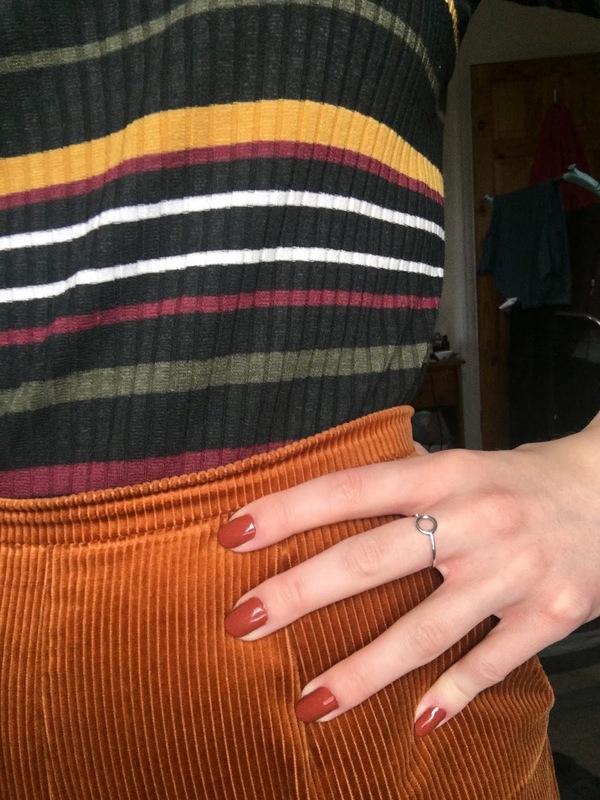 I think they've turned out quite quite cool in an unexpected corduroy, though based on the fabric recommendations and style, the pattern would work probably work best in something with a bit more drape. One of my biggest criticisms of the 'Big 4' patterns is that they often only list the finished hip measurement and don't include finished waist measurements too. Forgive me if there's something I'm missing here, but the waist of this pattern is particularly unforgiving, so I'd say it's a pretty important to know. From measuring the waistband pattern piece minus the seam allowances, I found that I needed to cut the 14 (good job I did this as I would've cut a 12 if going off my hips alone). The resulting fit is perfect on the waist, a little loose on the hips but in a nice, relaxed way that will work even better with a more drapey fabric. The waistband is surprisingly narrow and fits snugly without gaping. I would be tempted to add depth to it in future, though I think the narrowness (as well as reinforcing it with waistband interfacing) has limited the crumple which is often the norm for high-waist garments. I made them in just an afternoon/evening and they're overall a nice wear with particularly roomy pockets - yay for pocket fans! I'm sure I'll try them again in a more summer-appropriate fabric, or leftovers if I have any suitable! What else do they go with? The trousers fit in quite well with my current wardrobe. 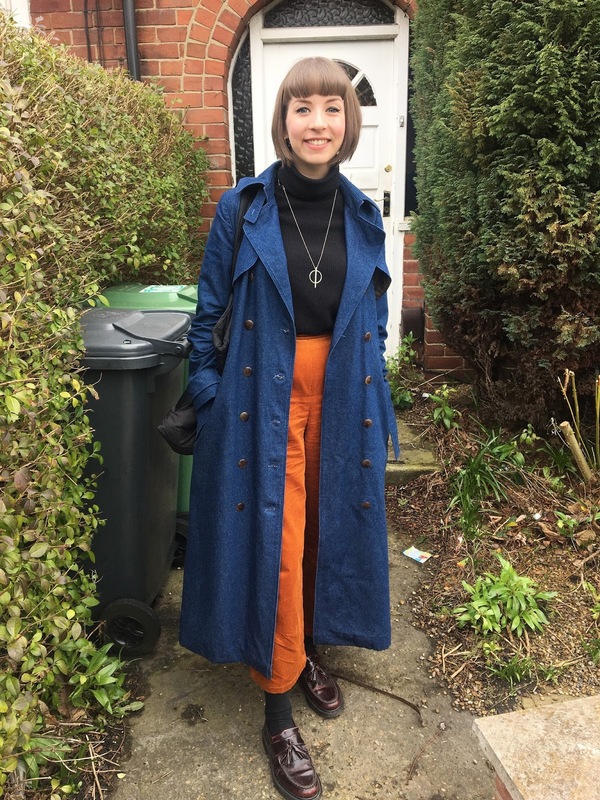 In the main pictures I'm wearing them with a sleeveless Papercut Patterns Rise Turtleneck hack, and below with a Fall Turtleneck and my Named Clothing Isla Trench, and with the True Bias Nikko Top. At the minute, I'm feeling most comfortable pairing them with a black top (they are quite a bold trouser after all), but I'm hoping that will change as I get more used to them. 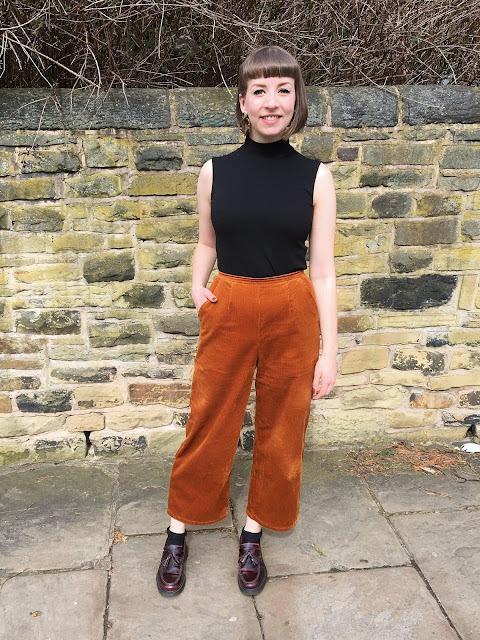 Thank you for reading about my first Sewing Leftovers make! I'm feeling inspired to hunt through my 'substantial scraps' and scout out my next make. I'll be sharing my Leftovers journey on the blog and on social media via #sewingleftovers. Please feel free to use the tag to share your own makes and ideas if you'd like to join in too! If you're taking part then I'd love to hear what your plans are - let me know in a comment below! They look great, Shauni! I absolutely love the rusty orange colour, very striking. I particularly like the trousers paired with the stripey top in the last photo. I have a good chunk of pink, chunky corduroy left over from my Turia dungarees shorts from a few years ago. Perhaps this year will finally be the year I finally make a skirt from it! Thanks Jo! I love the orange too, but they feel a fair bit bolder than the skirt I made in the same fabric. They're definitely for brace days haha. 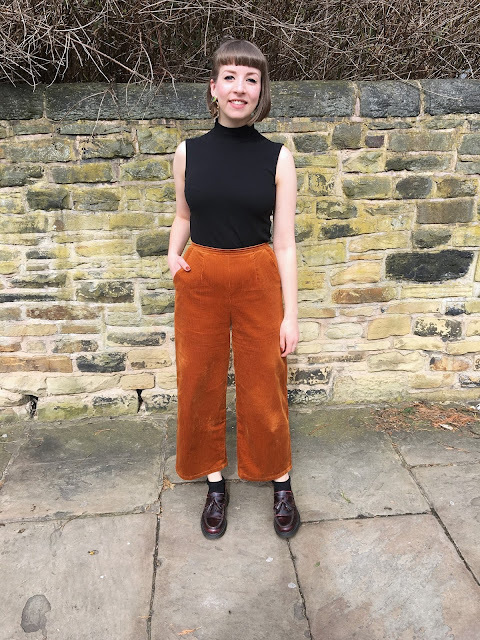 The pants look fantastic, and I love it when one can squeeze another clothing item out of leftovers; your project is brilliant! Also, I really like the orange corduroy with the blue of the coat. Think about that pairing as well! Thank you Claudia! Yeah it sort of feels like they were free if you know what I mean :) Hoping to do this a lot more in future!